Hello! Today I want to share with you a Fairy Valentine card that I made using some Adorable Vilda Stamps for our Vilda Stamps Challenge Blog February Challenge! 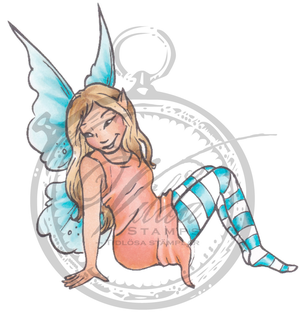 To make my card first I stamped this sweet fairy onto 110 lb. plain white card stock. Next I colored her in with Copics, and then used a white paint pen to add my highlights. I then fussy cut her out and set her aside. Next I cut my mats and frames from patterned and glitter card stock, and attached them to my card base. I also die cut out some flowers from plain white card stock and used Distress Ink to blend onto the petals. To finish I attached all of the card layers to my card base, and then added the sweet fairy with foam tape for some added dimension. After that I added rhinestones and some glitter leaves for some extra sparkle and shine. I hope that you enjoy my card, and are inspired to enter your own creations into our Challenge for your chance to win some Amazing Vilda Stamp prizes! Hello again Everyone! I have another card that I would like to share with you today. For my second card I created this Gnomes Kissing Valentine Card using a Gorgeous stamp from Vilda Stamps. To make my card first I stamped these darling Gnomes onto 110 lb. plain white card stock. Next I colored them in with Copics, and then used a white paint pen to add my highlights. After that I fussy cut the stamped images and then inked the cut edge with Mermaid Lagoon Distress ink for some added dimension. Next I cut my mats with dies and then attached all of the card layers to my card base. To finish I added some paper flowers, glitter die cuts, and rhinestones for some extra embellishment. Thank you for stopping by, I hope that you enjoy my card and are inspired to create some of your own Valentines with these Beautiful stamps! Hello Everyone! Today I want to share with you a Hello Rain Card that I created with one of the Adorable Sugar Bat stamps from Vilda Stamps. First I stamped the Sugar Bat girl onto 110 lb. plain white card stock. Next I used Copics to color the image in, and then used a white paint pen to add my highlights. After that I cut all of my mats and frames and attached them to my card base. I then used foam tape to attach the sweet Sugar Bat girl and give her some added dimension and height. To finish I added some paper flowers, a bow, and some rhinestones for some extra sparkle and shine. I just love these adorable stamps, and they really can be used in so many ways. I hope that my card has inspired you to try out your own creations with these Amazing stamps!